Life on the Empire’s edges is not for the weak. Danger aplenty awaits those who make their homes in the wild, from the roving bands of brigands—hard men and women driven to robbery and murder to make ends meet, beastmen, monsters, and so much more. All these pale beside the faeries, whose influence on humanity proves far more insidious than outsiders would ever expect. Faeries can be friendly, helpful even, but they follow inscrutable rules and expect others to adhere to them, even if the ins and outs of their customs are a mystery. Settlers, farmers, trappers, woodcutters and more who live near the borderlands must stumble through the forms and accept the gifts and aid without thanks. And they must offer gifts to placate the mercurial spirits or to make good one act that offended the faeries. However, even when the people do everything right, the faeries might turn against them. Why? Why not? 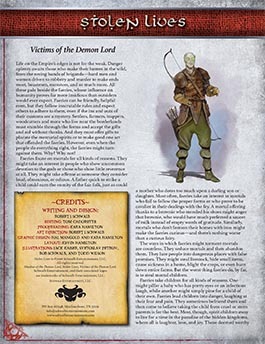 Stolen Lives details variant methods to allow you to create a Changeling character with even more detail and variation. Buy Stolen Lives in PDF from Schwalb Entertainment or DriveThruRPG!